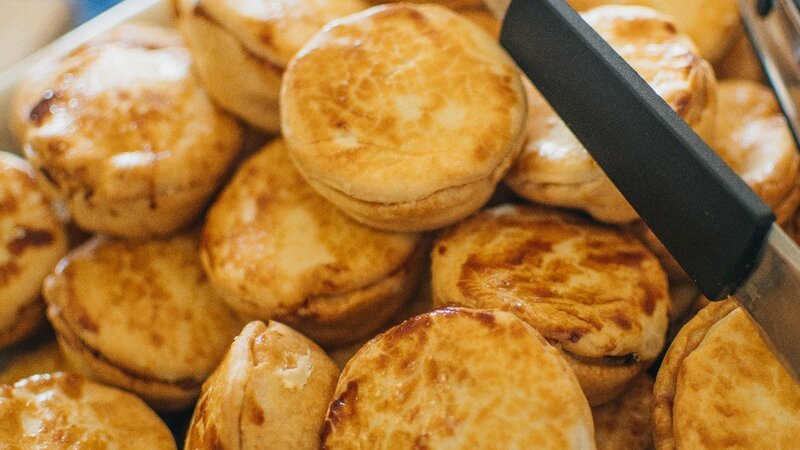 These classic Aussie pies with rich slow cooked braised beef filling topped with cheese and glazed shortcrust pastry, Ideal hot or cold. For more snacking recipes check out the Commonwealth recipe guide. In a large bowl place the beef, onion, KNORR Professional Garlic Herb Puree, thyme and Guinness, mix well cover and refrigerate for 24 hours. Remove the beef from the marinade and drain well, reserving the liquor. Allow to dry for a few minutes. In a large pan heat the oil and brown the meat. Then add the marinade, water and KNORR Roast Beef Bouillon mix together and bring to the boil. Once boiling reduce the heat to a simmer and cover. Cook the mix for 2.5-3 hours or until the meat is tender. Carefully strain the cooking liquor into a clean saucepan, reserving the beef. Whisk in the KNORR GRAVY Granules and simmer until thickened. Add the beef to the sauce and stir well, allow to cool, then refrigerate until required. Lightly oil 10 holes of a 12 hole muffin tin. Roll out the shortcrust pastry, then line the tins. Fill pastry cases 3/4 full with the meat filling and top with a disc of cheddar cheese. Place a lid on each ensuring to egg wash the top edges. Mix the egg yolks with the COLMANS English Mustard. and then brush over the tops of the pies. Make a small cross cut in the top of each pie using a small knife. Bake in a pre heated oven at 180c for 20-30 minutes and golden brown.